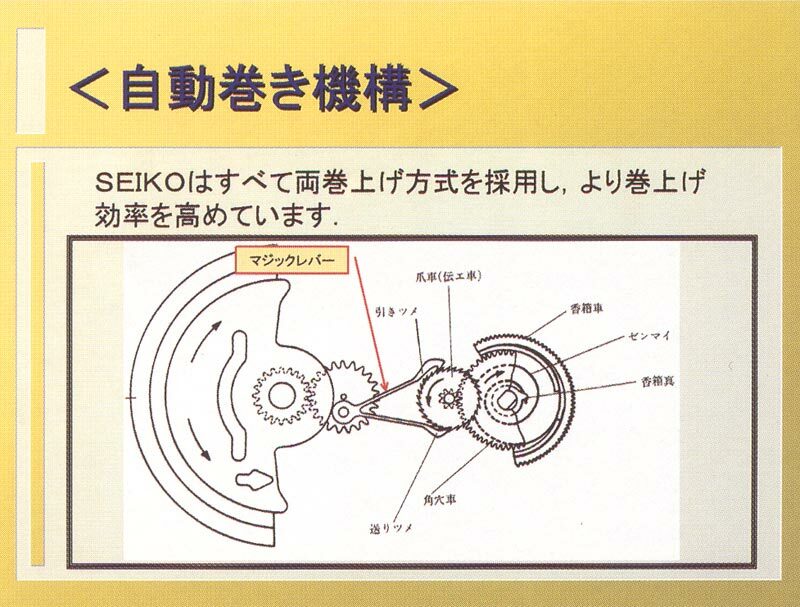 Here is a photograph of the Seiko Magic Lever. The rotor has been removed. 1. The Intermediate Wheel and Eccentric Pinion. 2a and 2b. The Magic Lever. 3. The Intermediate Wheel and Pinion. When the Intermediate Wheel and Eccentric Pinion (1) rotates clockwise, it will 'pull' the lever (2a) and that lever will pull the Intermediate Wheel and Pinion (3). When the Intermediate Wheel and Eccentric Pinion (1) rotates anti-clockwise, the lever (2b) will 'push' the Intermediate Wheel and Pinion (3). 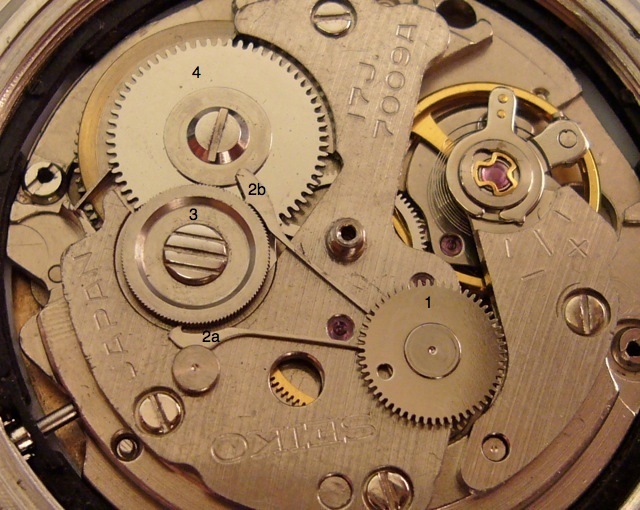 So regardless the direction of rotor rotation, the Ratchet Wheel (4) will turn and wind the mainspring. You can see the motion in the video below. In this video, you can see that regardless of the direction of the rotation of the magic lever, the barrel rotates in a single direction. I read that it takes about 160 to 170 turn of the rotor to wind the mainspring arbor one rotation. The diagrams below will also help to explain how the Magic Lever works. 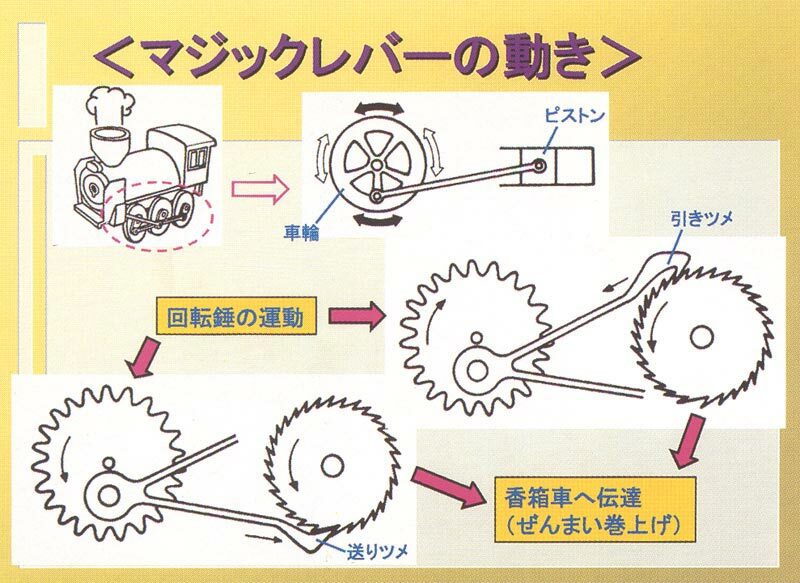 Hi, a nice write up of the magic lever system, but it leaves out the fact that the magic lever actually pulls for half a rotation of the intermediate wheel, then pushes for the other - regardless of direction of rotation of the intermediate wheel (or oscillating weight). 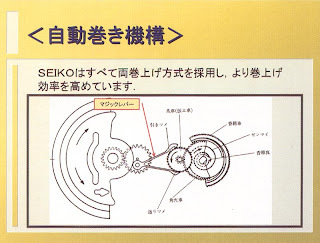 The Seiko diagrams and animations also are confusing in this respect. Welcome to the blog. Thanks for the input on the magic lever system.